From a distillery that’s been in operation since the 1980’s, formally known for their Eau De Vie, the team of Jörg Rupf, Lance Winters and Dave Smith have helped propel the same distillery the frontline of the gin world, making a line of gins that is as well-respected as it is imaginative: the Dry Rye which wears the Rye base on its sleeve, the legendary Faultline Gin, and their “it tastes like Redwood trees, but in a good way” Terroir Gin. But their Botanivore might be their most traditional offering, if you can believe it: with 19 botanicals ranging from the mundane (angelica) to the surprising (hops and dill). With 16 of the botanicals distilled in the their copper pot still, the cilantro, bay leaves, and juniper, are vapor infused via basket. The result is another spirit that makes you wonder how the team over there can come up with a line of gins that make you wonder how one distillery can have so rich in good ideas and good gins. Spicy, herbaceous, and citrus laden on the nose I get orange, cinnamon and cardamom, with a heady bay leaf undertone, but there’s a lot happening here, and you’d be forgiven for perhaps diving in more deeply to some of those citrus and spice notes. I almost get a spicy, sweet, cinnamon candy note if I ponder it deeply enough, however, it’s nicely balanced with quite a bit of complexity. I find it very inviting. 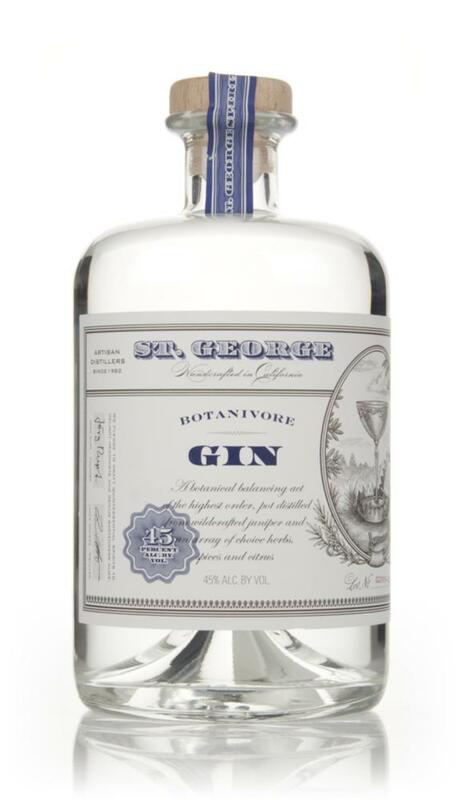 St. George Spirits Botanivore Gin has a thick, warm mouthfeel, with a slightly oily and rich character. On the palate, vivid cinnamon sticks, spicy ginger candy and bright pepper. You get a hint of almost Aquavit-like caraway; the finish is warm and spicy, with the medley of other notes singing, so much that you almost miss a brief flash of juniper, which I find comes on right after the ginger note subsides. Cool and piny, it’s hardly the dominant note, as the finish segues with hops and a touch of clean astringency, and a cool licorice like back note on the finish. In short, St. George Spirits Botanivore Gin is spicy and green, all at the same time. With a lot of complexity, but an uncanny balance, it’s a gin that I think embodies the best of what contemporary gin can strive to be. There is certainly a lot going on in here. I find that the Gin and Tonic and Martini best preserve the complexity of botanical character that I think makes this gin so outstanding; however, the herbaceous character takes over when mixed in cocktails for sure. I think it pairs well with citrus, in particular the Gimlet and Tom Collins, while, the Aviation overshadow some of the nuance. St. George Spirits Botanivore Gin is absolutely beautiful. Botanivore is a botanical forward contemporary style gin that showcases a carefully constructed melange of 19 botanicals where juniper, although not the front-man, contributed depth and color that links together seemingly disparate notes like ginger and cinnamon, cilantro and bay leaf, orange and lime, into something that’s as memorable as it is well distilled. Classic gin fans might be left looking for more juniper, but everyone else is well advised to take a look at one of the best gins to come out of the American gin scene, well ever. My favorite gin by far.. I have tried their Terroir Gin and it’s absolutely mind-blowing! It’s literally a liquid pine forest in your mouth..but your review on this one is dead on.. I love the subtle warmth it brings with a nice cinnamon and clove spicy kick.. a lushous oily mouthfeel that is rare in gin. This is a straight sipper for sure.. I wouldn’t dare basterdize it in a cocktail..